Here's the opinion piece I had published in today's Sydney Morning Herald. The events that led to the resignation of Opposition Leader Luke Foley deserve to become more than just another twist in the soap opera that NSW politics appears to have become. While I acknowledge the innocent parties in this disgraceful episode, specifically Ashleigh Raper, the problem is much deeper. The behaviour of elected MPs, particularly by those in the major parties during Question Time, can at times be disgraceful and an embarrassment. Things have to change, and they can be changed immediately if the parties themselves are willing. 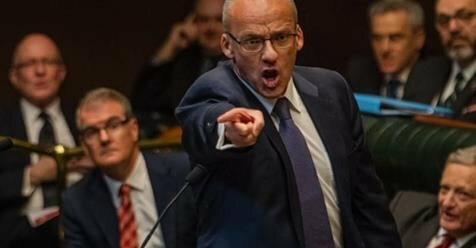 The events that led to the resignation of Luke Foley as leader of the Opposition deserve to become more than just another twist in the soap opera that NSW politics appears to have become. Let me first acknowledge the innocents in this most recent episode, most obviously journalist Ashleigh Raper. Ms Raper had her privacy and her right to determine how she wanted the matter handled stripped from her by Corrections Minister David Elliott using Parliamentary privilege. Sorry, Ashleigh, your personal life just wasn’t as important as an opportunity to score points against the opposition. Ms Raper would no doubt have family and friends who were also distressed by her treatment, but we shouldn’t forget the wife and children of now fallen Foley. There is no defence for the kind of behaviour Foley is alleged to have done. His position once the detail emerged was untenable and he was certainly right to resign as Opposition leader. Indeed, it seems he will not contest the next election. With new Labor leader Michael Daley calling for the Parliament to “raise its standards” I suggest that all members of the Parliament heed the advice that if they opened their ears they would have, and should have heard coming for years from those they represent. The public are sick and tired of this behaviour. The behaviour, particularly in the Legislative Assembly, can at times fall so low as to be nothing less than a disgrace and an embarrassment. Politicians know that they are generally not held in high regard in that sense and yet so many cannot bring themselves to improve how they perform their role in the House. are charged with emotion that can boil over; but the reality is that there are far too many members who thrive on this show that they refer to as “theatre” and who too often take the debate into the shallows of acceptability. This latest incident is a perfect example but it certainly is not an exception. government and opposition could take a lead from the crossbench, which in my nearly 12 years in Parliament has always seen a high standard of behaviour from independents and minor party members. There has been speculation that a hung parliament is a possibility after the next state election. If that were to occur I’d suggest that crossbench members would be seeking to effect change in the behaviour of the House; certainly that is the view of the current independents. of behaviour in the House but that has never stopped them from disgraceful behaviour that would not be tolerated in any workplace, school, community group or institution within our community. The behaviour of the Parliament, in particular during question time, brings about contempt for an institution that so often sits in moral judgement of others. It is the height of hypocrisy and a solution does not rely on a hung Parliament as the Premier, her government and members of the Opposition could immediately fix this broken system if they wished. This sorry episode will hopefully lead to better behaviour in the NSW Parliament. Greg Piper is the member for Lake Macquarie. This article has been endorsed by Alex Greenwich, member for Sydney, and Dr Joe McGirr, member for Wagga Wagga.